by Kenyatti Hellum, Daria Siler, LaTierra, Wells, Desiree Tellis, Tevin Ratcliff, Aaron Shannon, Rachel Kibblesmith, M.S.W., & Jeffrey Bulanda, Ph.D.
Abstract: The C.R.I.M.E. Teens Project (Compassion, Respect, Inspiration, Motivation, Empathy) is a grassroots, youth led violence prevention program. Since its inception in 2009, the C.R.I.M.E. Teens have worked toward multiple achievements, most notably presenting to hundreds of elementary, middle school, and professional populations through an adolescent-centric perspective of community, school, relational, and familial violence, and authoring and publishing a book targeted to educators and direct service professionals on how to better understand the youth experience of violence. This paper is a written collaboration between the C.R.I.M.E. youth and the adult supporters to dive deeper into the critical issues of violence against young girls and women, particularly focusing on cyber bullying, relational violence, and teen dating relationships. The young women of the C.R.I.M.E. 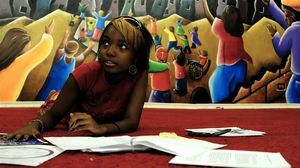 Teens also provide personal narratives of their own experience with complex trauma and violence and their stories of resilience and advocacy to aid other young girls and women in their own recovery.